"Do not call up any that you can not put down." 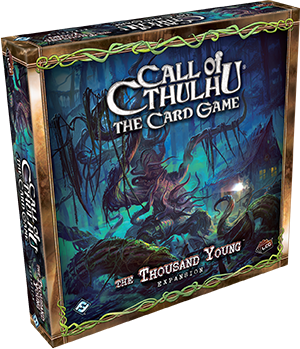 A new gate has opened in southern Louisiana, and new powers make their way into our world, tempting mortals toward evil with the blessings of their blasphemous mother, the fecund Ancient One and All-Mother, Shub-Niggurath, the Black Goat of the Woods… The Thousand Young deluxe expansion for Call of Cthulhu: The Card Game is now available at your local retailer and online through our webstore. 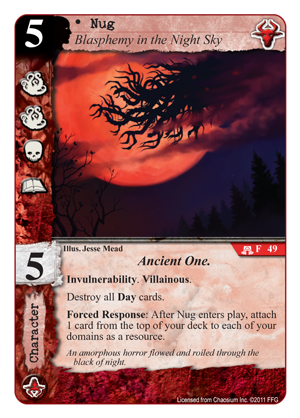 Focusing on the Shub-Niggurath faction, The Thousand Young expansion introduces 165 new cards (three copies each of fifty-five different cards), nearly two-thirds of which lend new strength to the Black Goat of the Woods, her countless progeny, her cultists, and their tactics. Simultaneously, it explores Shub's influence amid the bayous of southern Louisiana and within the streets of New Orleans. There, sinister Monsters walk unnoticed among the unsuspecting populace, Cultists conduct foul rituals, and Shub's more Independent followers hunt for powerful and arcane knowledge amid the city's seediest Locations. However, Shub-Niggurath and her followers are not the only forces at work in The Thousand Young. The malevolent Ancient One Nyarlathotep also prowls the Big Easy, assuming different guises to insinuate himself among the game's various factions and advance his inscrutable agenda, whatever it may be. 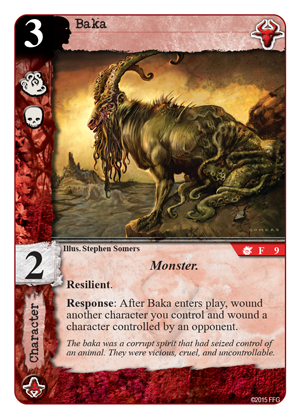 Finally, all of the game's factions find new characters and support cards that allow them to lend their support to Shub-Niggurath or Nyarlathotep or to work up their courage and stand against them. Will you join the cult of Shub-Niggurath? Will you join humanity's fight against the rising Ancient Ones? The choice is yours with The Thousand Young… provided you dare to dabble with its dark and powerful magic and its newly-spawned Dark Young. 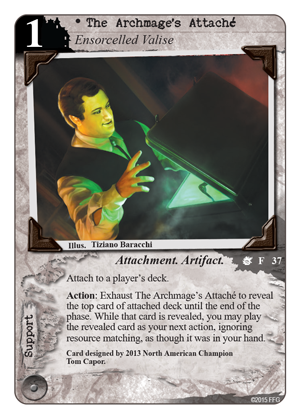 In our earlier previews of The Thousand Young, we looked at the hordes of new creatures that Shub is spawning, we explored the secrets concealed behind the closed doors of New Orleans and within the thickest groves of Louisiana's muggy bayous, and we witnessed some of the many tricks that four-time World Champion Tom Capor packed into his Champion card, The Archmage's Attaché (The Thousand Young, 37). 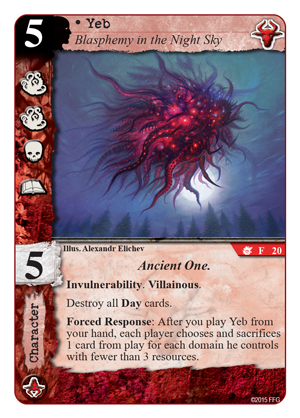 We even caught a glimpse of Nyarlathotep in action in the expansion's announcement. Still, there's more to The Thousand Young than its Locations, Monsters, Avatars, and its host of other characters. Otherworldly Ancient Ones like Shub-Niggurath are immensely powerful and defy human understanding as do their powers. Moreover, they can bestow some of these powers unto their followers, even as some exceedingly bold mortals may attempt to tap into them via foul spells and dangerous rituals. Many of these Rituals and Curses appear in The Thousand Young, and some may even offer you and your deck the secret to immortality. 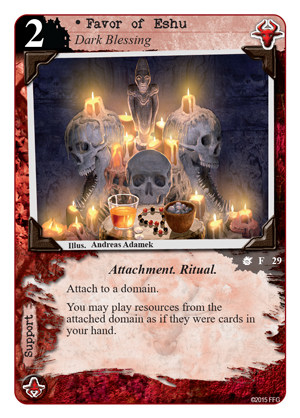 The Favor of Eshu (The Thousand Young, 29), for example, allows you to use the resources that you stockpile in one of your domains as though they were cards in your hand. The ability to create a "second hand," as it were, has previously been explored within the Yog-Sothoth faction in The Key and the Gate and has been proven to be extremely powerful. 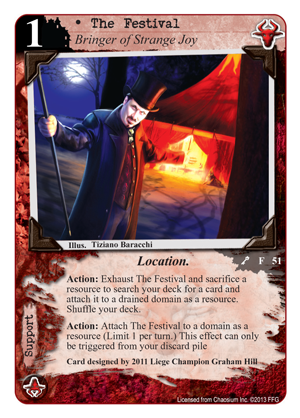 While it's true that playing cards out of your domain then reduces that domain and limits your ability to pay for future cards, it's also true that no faction does a better job of building massive domains than Shub-Niggurath, which features such powerful cards as Feed Her Young (Written and Bound, 11), The Festival (The Key and the Gate, 51), and Nug (Seekers of Knowledge, 49). Just as it's easy for a Shub player to shape an entire strategy around resource ramping, you can also punish those who don't by incorporating such characters as Elspeth Baudin (The Thousand Young, 11) and Yeb (The Thousand Young, 20). 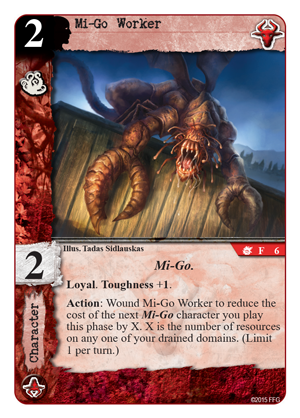 Paired together, these Shub devotees force players to pay a premium for their cheapest characters and then build their domains beyond the costs of the cards they want to play lest they risk having to sacrifice those cards later in the game. "Action: Choose and destroy a Location support card. 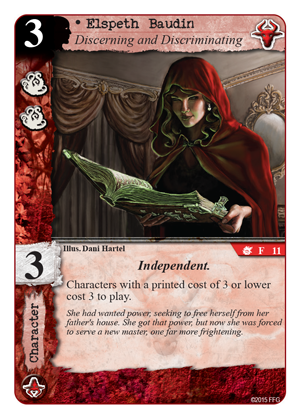 Then, that support card’s controller reveals cards from his deck until he reveals a Location support card. Set that card aside, and shuffle that deck. Then, put the set aside support card on top of its owner’s deck." 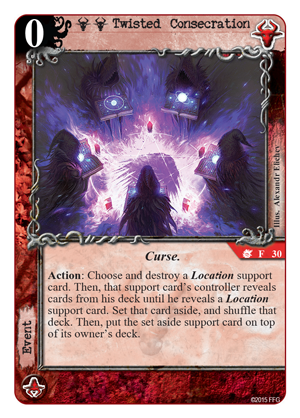 The fact that the curse is limited to Location destruction seems to justify its zero cost, as does the fact that it allows the support card's controller to place another Location on the top of his deck. However, the card's most truly powerful effect lies hidden within the act of replacing the destroyed Location; your opponent must reveal cards from the top of his deck until he reveals the next Location support card. When you play Twisted Consecration, you guarantee yourself not only a limited measure of support destruction, but also a valuable measure of insight into the nature of your opponent's deck. Depending how few Location supports your opponent plays, your Twisted Consecration may even force him to reveal his entire deck. 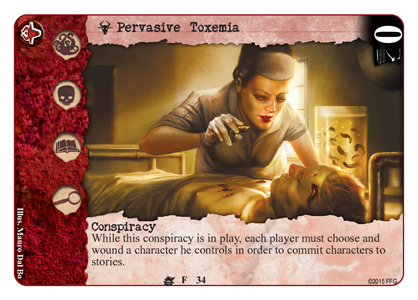 If Tom Capor's preview of his Champion card left you wondering to which deck you should attach your ensorcelled valise, playing Twisted Consecration could very well provide you enough intelligence to make an informed decision. Finally, few Spells threaten to make as dramatic and immediate an impact as Iä! Iä! (The Thousand Young, 32), which allows you to remove all the wounds from any or all of your characters and assign them to your opponent's characters, divided between them as you see fit. Let's begin our examination of this Spell by looking at its ability to "heal" your characters. This is an exceedingly rare and powerful ability that shouldn't be undervalued. 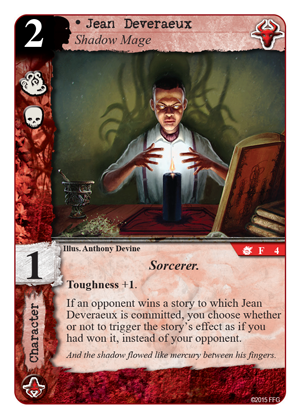 After all, there are very few other cards in Call of Cthulhu: The Card Game that remove wounds, and of them, only Mu (Seekers of Knowledge, 24) removes wounds from any character. This means Iä! Iä! opens strategies that may not have previously existed, and it gives greater fuel to others. For example, you begin to get much greater mileage out of such new Shub characters as Jean Deveraeux (The Thousand Young, 4), Mi-Go Worker (The Thousand Young, 6), and Baka (The Thousand Young, 9). Additionally, Iä! Iä! 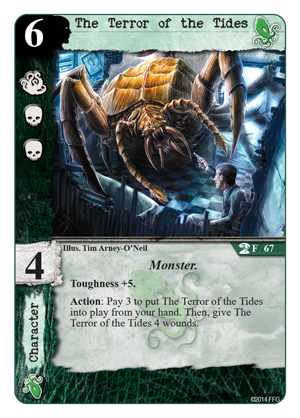 opens room for some truly terrifying combinations with the Cthulhu faction and The Terror of the Tides (The Terror of the Tides, 67). The fact that Iä! Iä! 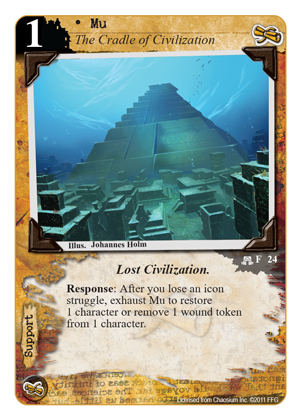 is loyal makes it tricky to play around in a deck that combines two factions, but The Terror of the Tides can be played for three resources of any color as an action from your hand. Then on a subsequent turn, you can play Iä! Iä! 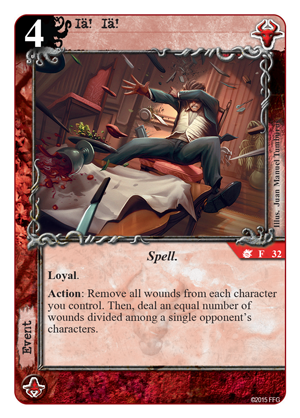 to heal the Terror's four wounds and deal those wounds to your opponent's characters. This, of course, is where Iä! Iä! is most obviously terrifying – in its ability to inflict mass damage – and it's highly likely that Shub's forces will soon take advantage of their toughness and Pervasive Toxemia (The Thousand Young, 34) to decimate whole hordes of opposing characters. 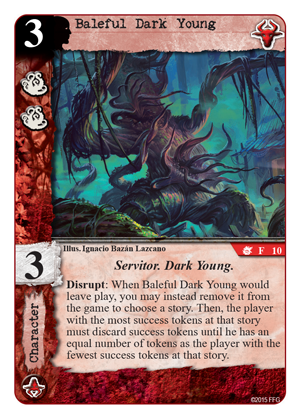 Finally, no expansion dedicated to the forces of Shub-Niggurath would be complete without introducing another of her Dark Young, so The Thousand Young gives us both Dark Sargassum (The Thousand Young, 22) and the Baleful Dark Young (The Thousand Young, 10), an excellent defensive character that you can sacrifice to buy time to raise your army of unholy spawn. 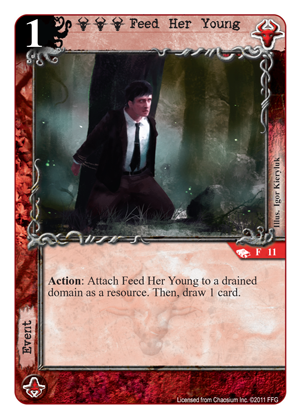 When Baleful Dark Young leaves play, you may instead remove it from the game to choose a story and force the player with the most success tokens at that story to remove success tokens from it until he has no more success tokens than the player with the fewest success tokens. Ideally, this allows you to strip four success tokens from a story that your opponent was about to win and at which you had zero success tokens. 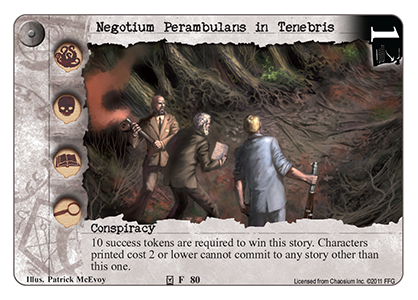 Or even better, if you're playing toward the long game, you can remove as many as nine of your opponent's success tokens from Negotium Perambulans in Tenebris (Dunwich Denizens, 80), ensuring the conspiracy continues to trap your opponent's cheapest characters. 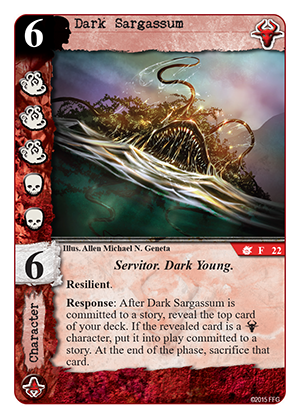 Ultimately, such tactics allow you to play toward an endgame in which your largest and most expensive characters, like Dark Sargassum, can simply outmuscle (and out-terrify) your opponent's minions, and no faction does a better job than Shub at building quickly toward an overwhelming horde of late-game Monsters, Servitors, and Ancient Ones. The only question is which characters, supports, and events you'll use to stall your opponent until that point, and with which you'll devour all humanity once you've gotten there. Based on the fiction of H.P. Lovecraft and his literary circle, Call of Cthulhu: The Card Game takes two players deep into the Cthulhu Mythos where investigators clash with the Ancient Ones and Elder Gods for the fate of the world. 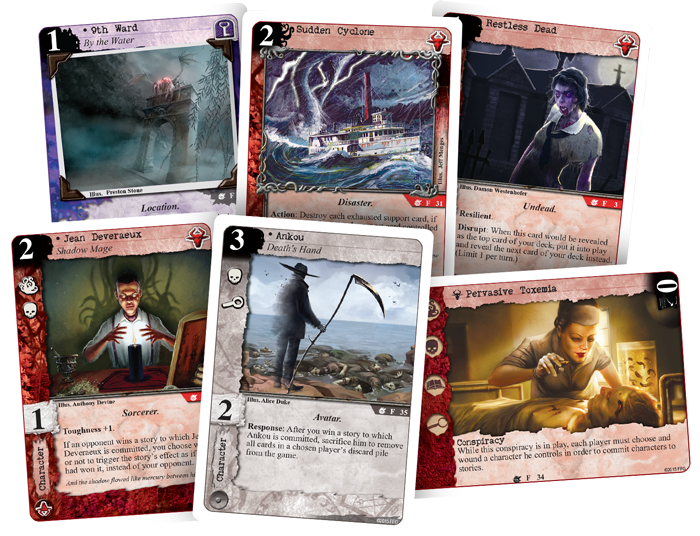 The Living Card Game format allows players to customize their gaming experience with monthly Asylum Pack expansions to the core game.